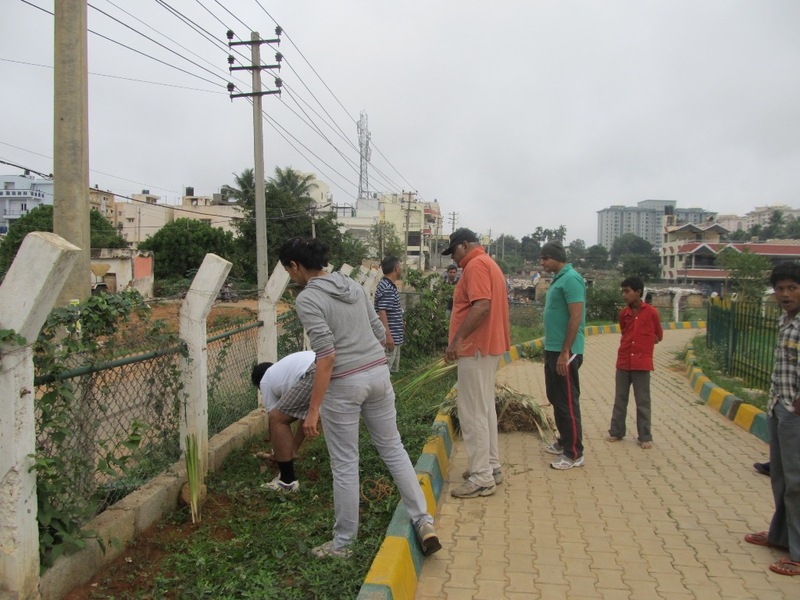 There were not too many immersions at Puttenahalli Lake this year. This may have been because the water in the lake is not very visible because the surface is covered with the invasive Salvinia fern. Another hopeful reason could be that people immersed their Ganeshas right at home! 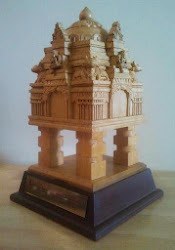 According to our gardeners, about 10 to 12 idols went into the immersion drums that PNLIT had placed and there was one that someone had thrown just within the inner grill. One of the idols was from a travel agency in JP Nagar 9th Phase. It was good to see that most of them dissolved in the water. Eco-Ganesha kai hote? (What is Eco-Ganesha?) For sixty year old Savitri, who has lived all her life in a village in Maharashtra, the only Ganeshas she knows are the ones they make with the soil from the beds (and surroundings) of lakes and ponds in her village. Her first time in the city, Savitri is astounded by the size and the variety of Ganeshas she sees in the shops and Eco-Ganesha is a word that has got fixed in her memory forever. Like many proud Marathas, Savitri says that the Ganesha festival itself originated during her ancestor Shivaji's time, or so her grandmother told her. She is happy that the festival is celebrated so grandly in the city, but little does she know that many city dwellers are trying to emulate her and her village mates today. 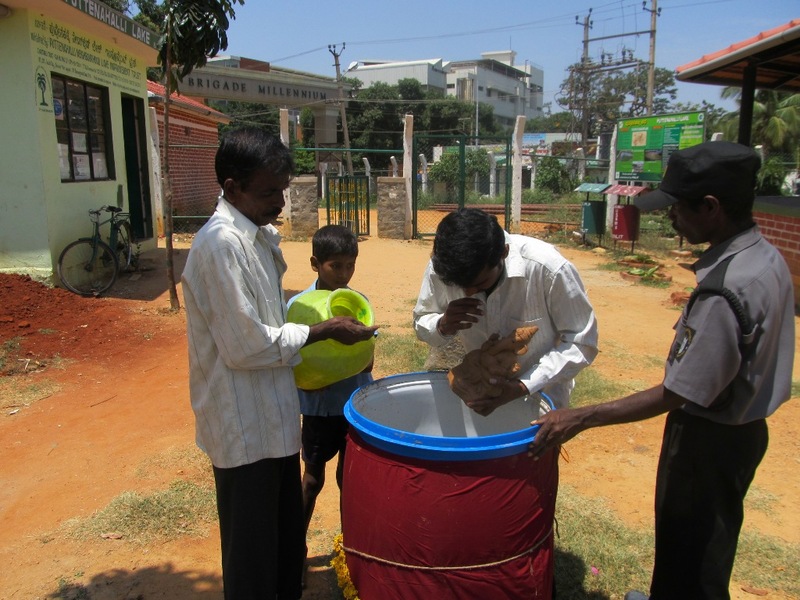 In Savitri's village, preparations for the festival begin several months earlier. During the summers, the water levels in the lakes fall and the local potters collect the soil from the lake beds. 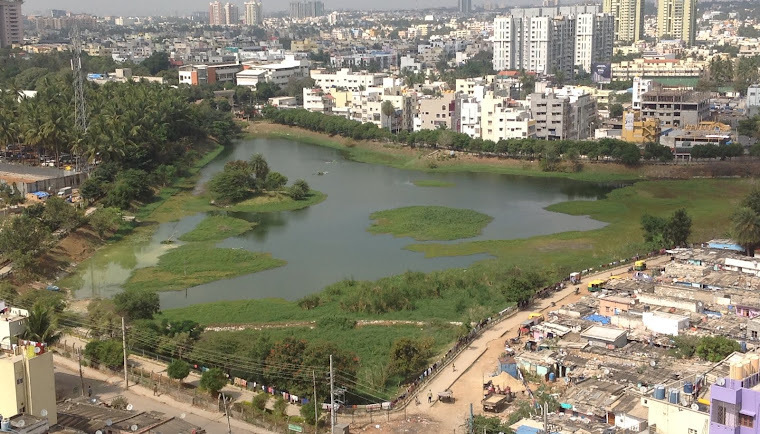 Though the impact of digging soil out from lake beds is debatable, when done in moderation, it is said improve the availability and quality of water and provide a better habitat for the water life (like the fishes and frogs) when the monsoon arrives. The Ganeshas are made in the summer months itself, naturally dried and then stored to be decorated shortly before the Ganapathi festival. 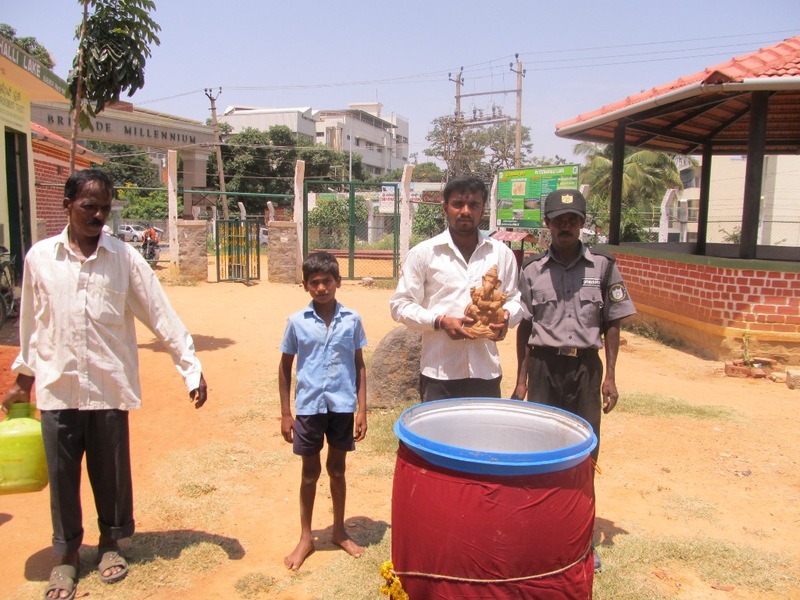 The potters use their own dyes made with turmeric, red mud, plant and other natural colours. At the end of the festival, the Ganeshas go back into the lake waters from which they were born, cleansing and nourishing the water with the herbal properties of the decorated idols. Water to water. Today, we are dissuading people from going to lakes with their Ganeshas. There are several eco-friendly alternatives that have been advertised. The government has also been asking people to go in for mud and clay Ganeshas, painted with natural colours, of small size that can be immersed at home. Despite this, it is expected that majority of the Ganeshas will not be 'eco-compliant' and their worshippers will be seeking out lakes. The material with which the Ganeshas are made, the paints used to colour them and the other accessories that are put on the Ganeshas are most likely going to be harmful to water bodies and the lives they support. 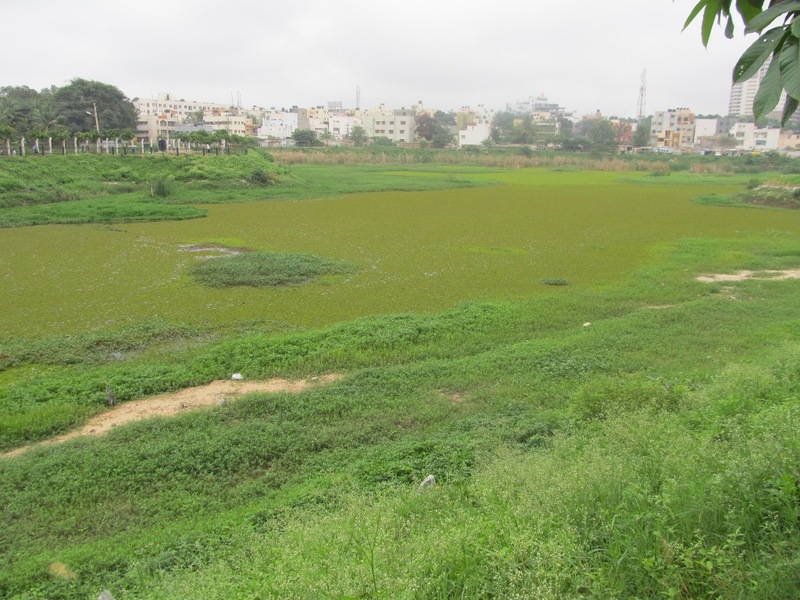 Puttenahalli Lake is not on BBMP's list of lakes designated for Ganesha idol immersion. "Immersion of idols" is also on the list of Don'ts. But we are prepared! PNLIT has organized two different immersion points where water drums and flower collection baskets have been specially placed. 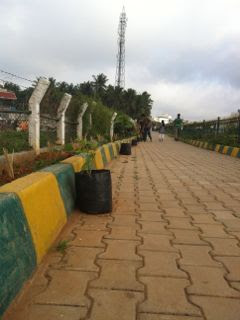 A watchman and volunteers will also be on duty. 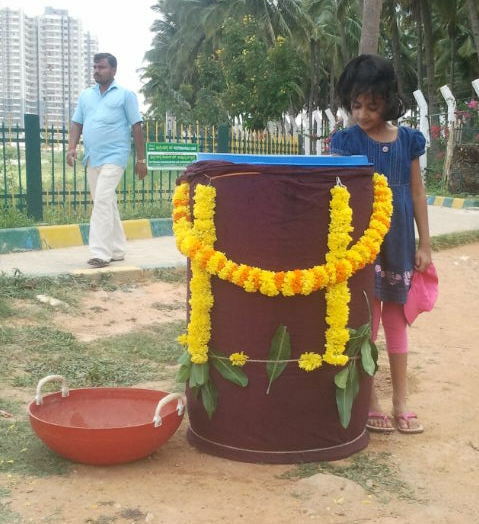 Devotees who do turn up at Puttenahalli Lake will be asked to immerse their Ganeshas in the water drums at these points and save the lake! The second season of Mahindra's Spark the Rise begins on 17th September 2012. See the Spark The Rise journey video here. The Rise Blog said, "In order to re-ignite conversations and spread the word, we're conducting an exciting three-city tour of India." Three 'Be the Spark' Meet-Ups were held over the last three Saturdays in Delhi, Bangalore and Mumbai. Each meet had a different topic of discussion and some of the leading social entrepreneurs, change-makers and change-agents in each city were invited to be a part of panel and general discussions on the topic. Usha Rajagopalan from PNLIT was one of the panellists at the Bangalore meet and Arathi Manay from PNLIT attended the Mumbai meet as a guest. 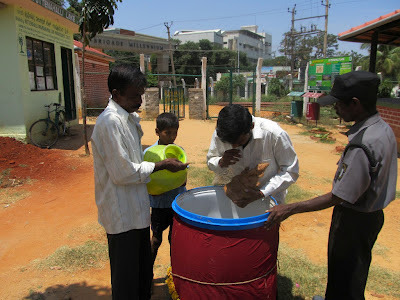 Delhi, 1st September 2012 - How can we deliver services to entrepreneurs in rural India? Bangalore, 8th September 2012 - How do we harness the power of the collective to create an ecosystem rather than focus on the individual? Mumbai, 15th September 2012 - How do we create an environment that encourages people to become entrepreneurs, especially recent college graduates? - 48 grants of Rs 4 lakh each and 4 grand finale prizes totally Rs 1 crore awarded, Season Two is expected to be even better. Improvements and refinements have been made to the listing of ideas/projects, voting and awards. 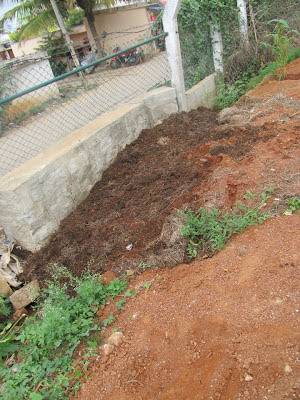 PNLIT's Puttenahalli Lake nurturing project was one of the 48 projects that received a grant during Season One, and PNLIT went on to be one of the 18 finalists who vied for the finale prizes. 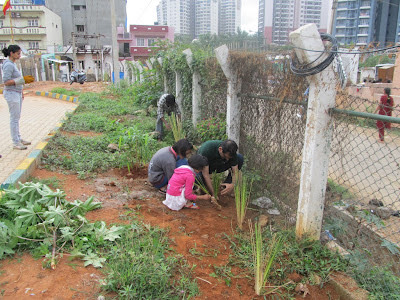 Spark the Rise has helped PNLIT in building awareness of the importance of water bodies and public open spaces, and the instrumental role of local citizens in safeguarding their environments. Improved visibility has resulted in more volunteers, sponsorship of specific items for PNLIT and more importantly, an active "lake saving movement" in Bangalore. With the grant received, PNLIT has put up important signage at the lake, planted about 100 more trees and shrubs to attract more birds and insects, enriched the soil, installed rain water harvesting infrastructure for water supply, got uniforms for the staff, bought required gardening tools and equipment, cleared a large portion of the lake bund of unwanted material, developed additional waste management/ composting facilities, installed exercising infrastructure... and we have plans and some money left to do some more to nurture Puttenahalli Lake back to its pristine glory! If you know anyone who has a promising idea or project in progress, encourage them check out the Spark The Rise Website. It may help them become a Spark! "Spark the Rise is a platform whose core purpose is to drive positive change in the lives of our stakeholders and communities across the world—to enable them to Rise. Spark the Rise enables lots of people to drive positive change by bringing them together behind innovative ideas and awarding the grant money needed to put them into action. Spark a fire—start a movement." PNLIT had requested volunteers to help with the planting of a few indigenous saplings at the Puttenahalli lake on Saturday 15th September. 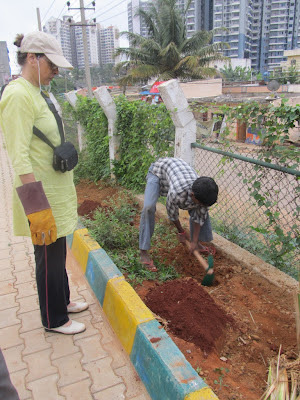 The process involved digging or expanding the existing pits, planting the saplings, filling with red soil and compost and if found necessary, securing the saplings with tree guards. We had a successful day this morning at the Lake planting the saplings. 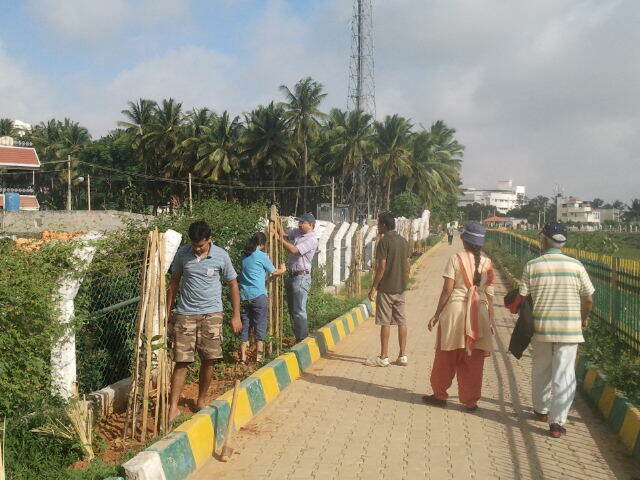 It was encouraging to see our friend Pankaj who had cycled all the way from Whitefield to give us a helping hand. 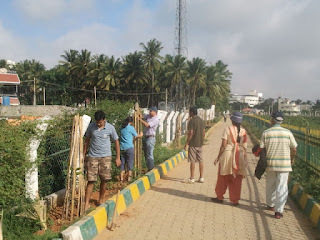 There were many others including Meera, Prashanth and wife from 24th Main, Dhaval and wife Gargee all the way from Koramangala, Vani from Cassia, Vivek's friend (he's been at the lake before and helped a lot) and of course PNLIT team Vivek, Vijay, OPR, Nupur and young Vishnu who joined after completing his home work. Thank you Arathi for your Facebook announcement, we got most of them from there. 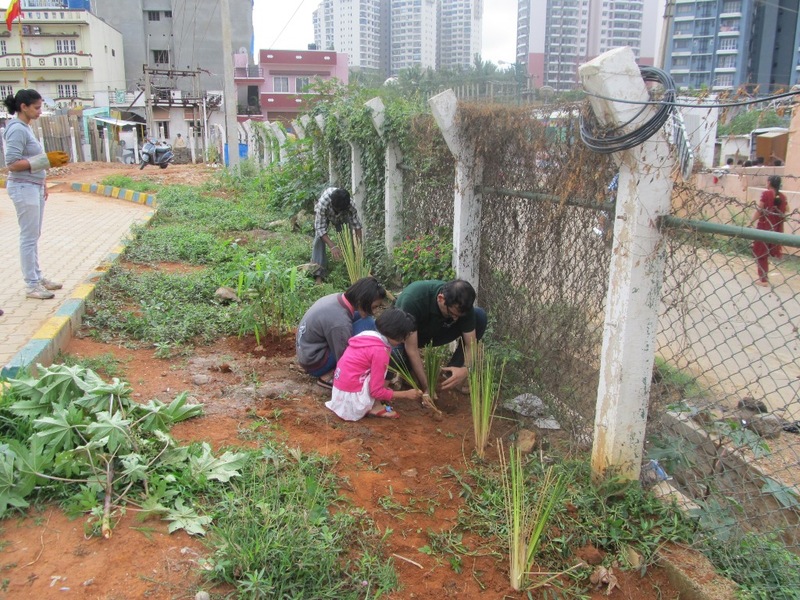 In all we planted 18 saplings and most of them got tree guards around them. 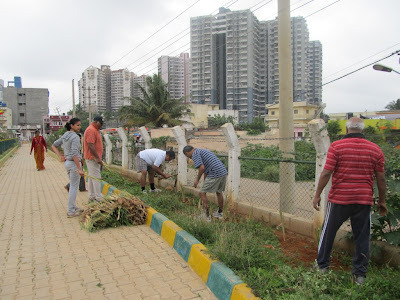 These saplings included: Mango, Shivani, Muthuga (Flame of the Forest), Banni, Red Sandal, Parijata, wild Asoka and nati/country variety of Panerle (also called Paneer fruit). 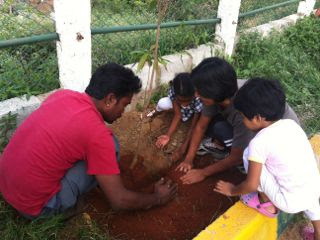 Sapana got her little daughter to plant a 5 ft tall Mango sapling as a birthday gesture. 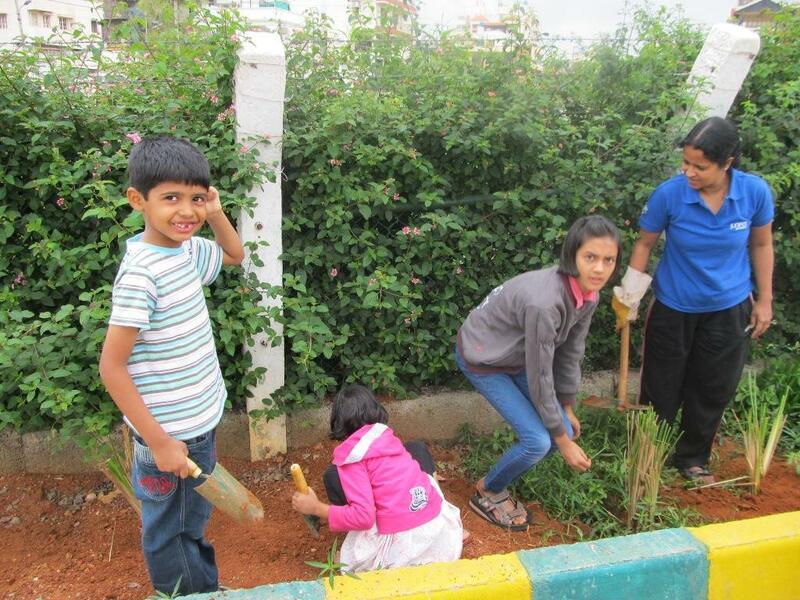 Aditi, on whose 6th birthday we did a nature walk around the lake last year, turned 7 recently and has been wanting to plant a 'nice' tree, got her wish fulfilled this morning. She had a great time along with her younger sister Mahiti. They both want to come every Saturday to plant trees :-). Many thanks to Vijay for letting them tag along, Pankaj for taking their pictures, and of course the Uncle with a big cap (Prasanna) and the 'older' Uncle (OPR). More photos taken by Pankaj Dugar can be see here. It is ironic that after praying to Ganesha, considered the Remover of Obstacles we cause such terrible damage to water bodies by immersing the toxic painted idol and killing aquatic life! Please get an eco friendly Ganesha idol and save the environment. All lakes and tanks in Bangalore have sewage water either pouring in directly or which is residual. Are you sure you want to immerse your beloved Ganesha in such muck? 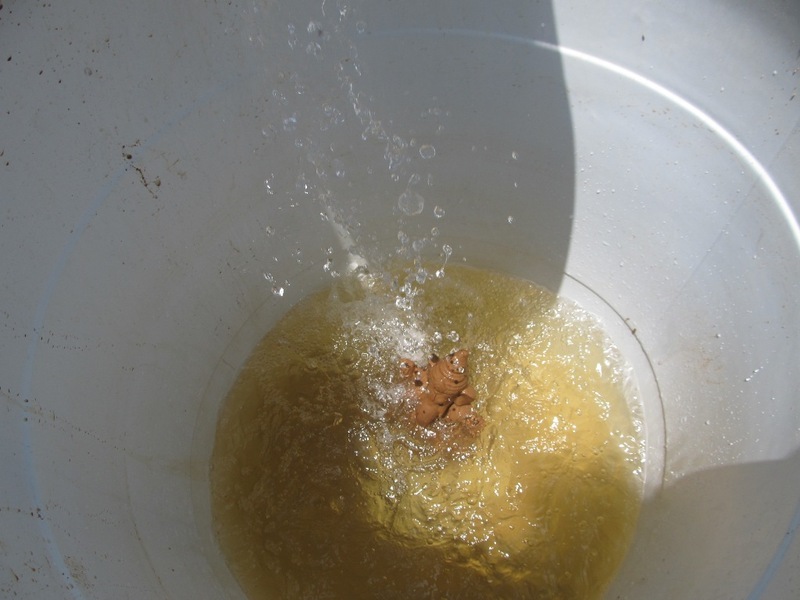 Complete the sanctity of your prayer by doing it in your own house in a bucket of clean water. Here is a link for contacts of Eco-friendly idols. Have a great Ganesh Chaturthi but don't let your devotion kill a lake and the many lives it supports!